Pros: A captivating delivery of a charged and lyrical script. A powerful combination of meaty script and dynamic acting make this a delicious and poetic production. 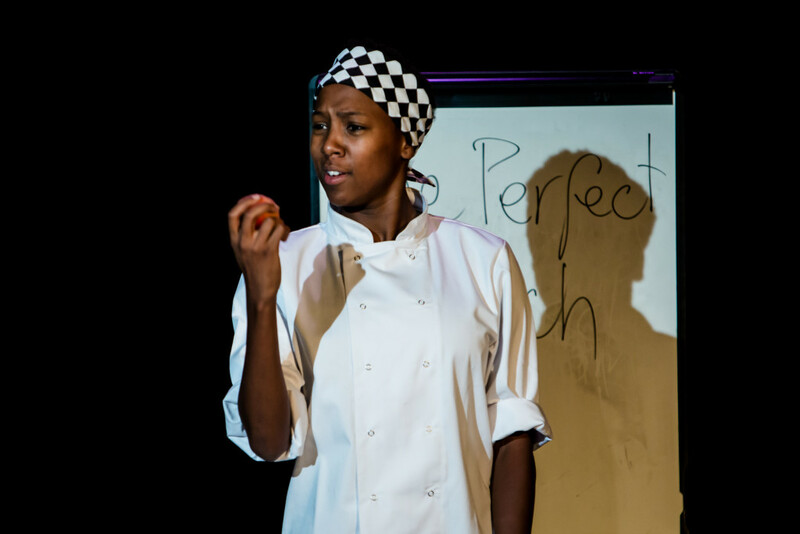 The Soho Theatre‘s upstairs never fails to bring a captivating story to the stage, but the intimate blackbox venue has outdone itself in welcoming Chef, winner of the 2014 Fringe First Award for its London debut. 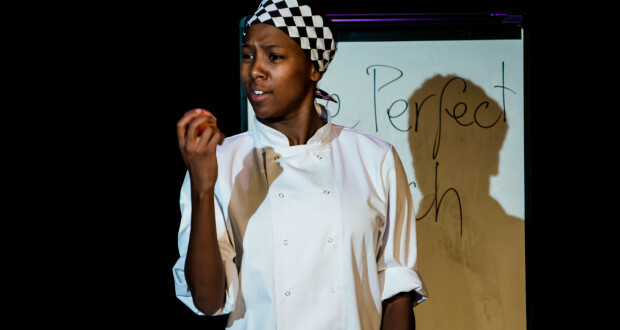 Sabrina Mahfouz’s script is appropriately tasty and brought to life full-force with a stunning performance from Jade Anouka. The story unfolds through a menu as a once well-received, now incarcerated chef walks us through her favourite dishes and the unsavoury string of events that led her to prison. The stage is practically bare, but for a single stainless steel worktop boasting a few essential cooking tools to set the mood. The central point of focus is the menu planning dry erase board perched on top of the work surface, where the chef changes the featured dish as she changes the discussion. We glide through a tasting menu, starting with a peach and moving down the line from curried tofu to risotto to desert. The discussion of each dish is associated with the developing story line; it’s clear that the chef communicates through food. Cooking is her first language and she only opens up as things relate to her dishes, or as elements of her cooking seminar (that seems to be what she’s giving us) jog her memory. 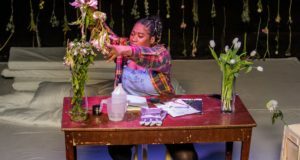 As Chef, Jade Anouka is a splendid and captivating life force: not one moment of the solo performance led my mind to wander. That’s rare praise from me, since I have never much cared for solo acts; my tastes tend towards chemistry between characters. But Anouka proves that a short, solo work can be as engaging and delightful to watch as any full cast drama. 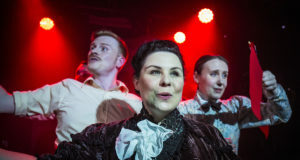 She takes on the occasional second party’s characteristic with such ease that it’s sometimes hard to forget there aren’t two people on the stage after all. She truly is an incredible performer, and I couldn’t be happier that I got to witness her work with such a sense of focus, timing and clear understanding of the work. Mahfouz’s script sets her up for success from the beginning. Dripping with rhythm and metaphor, the writing negotiates the space between creative license and raw experience to perfection. Hardly a second seemed overdone; while there were moments where the weight of metaphors and references went straight over my head, they never gave me much pause and I was delighted to be enveloped in such deft writing. Anouka and Mahfouz are a forced to be reckoned with and my only complaint is that the play, which began a hair after 7pm, had me blinking into the well-lit evening before 8pm. The play was far too short for my liking considering the quality of the work and I would have happily been back for a second act. I’ve seen enough solo acts that went on too long, but never one I would have gladly seen more of. It’s a real shame there isn’t more time to bask in Anouka’s stellar delivery of Mahfouz’s shining script.